So today we dig deep into the underworld to find a wonderful destination for family members to go after they've already experienced the second floor of the old tire factory in Oaks (we mean the American Treasure Tour, of course). Really, who doesn't love a good cave tour? There are so many amazing cave networks around the world, it's truly impossible to limit your caving experience to just one. So we recommend hitting all of them. It may take some time, and you have to start somewhere. If you're from the Oaks or Phoenixville area, and you have not yet taken your loved ones out to Indian Echo Caverns in Hummelstown, PA (four miles from Hershey), then I'm afraid you may be in some trouble. 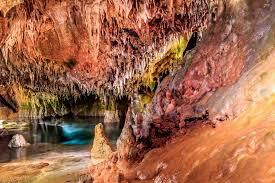 The caverns are open year round and they offer a good mix of fun, fascinating, educational and, well, fun. First discovered by the Susquehannock Indians who once roamed the area, European fur traders wrote about them in the 17th and 18th centuries, intriguing travelers to the region with tales of their beauty and charm. A man named Bieber opened them for tours in 1929 (no, it was not Justin Bieber. His name was John), and they have remained open pretty much ever since. They are well worth the trip out to the region. And, if you are a fan of chocolate, you would be crazy to not haul off to Hershey after you're finished with your guided tour!